Research by Djordje Djukic. Map by onestopmap.com and Evan Centanni. After years of proxy fighting in central and southern Libya, forces allied to the country's two rival governments are finally facing off directly around capital city Tripoli. In just the past two weeks, there have already been many changes to territorial control - mostly gains for the eastern-allied Libyan National Army (LNA). See all this and more on the latest update to PolGeoNow's concise, professional Libyan Civil War control map, which comes with a timeline of changes since our previous Libya control map report in April 1, 2019. Up-to-date map of current territorial control in Libya, color-coded for the UN-backed Government of National Accord (GNA), the rival Tobruk parliament and Khalifa Haftar's Libyan National Army (LNA), the so-called "Islamic State" (ISIS/ISIL), and Toubou and Tuareg militias in the south. Colorblind accessible. 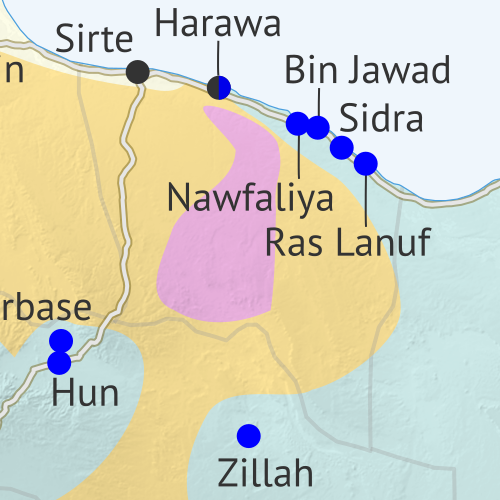 Locations of recent fighting and changes of control, including Aziziya, Ain Zara, Tripoli International Airport, and more. Detailed timeline of important events and changes to territorial control since April 1, 2019, with links to sources. Categories: africa, conflict zones, divided countries, isis, libya, premium, rebel control, the "islamic state"
Over the past month, the eastern Libyan National Army (LNA) has continued its rapid advances across the south, seizing control of several towns and oil fields previously controlled by independent Toubou and Tuareg militias. Meanwhile, Libya's two major rival governments continue vying for power in the north, and the so-called "Islamic State" (ISIS/ISIL) is still present in some desert areas. See all this and more on the latest update to PolGeoNow's concise, professional Libyan Civil War control map, which comes with a timeline of changes since our previous Libya control map report in February 2019. 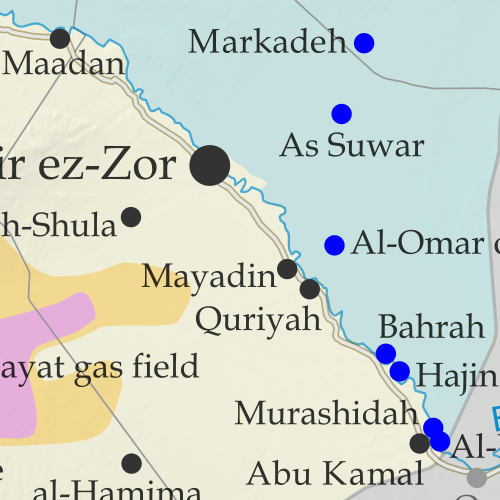 Locations of recent fighting and changes of control, including Murzuq, Ghadduwah, Qatrun, Uwaynat, and more. Detailed timeline of important events and changes to territorial control since February 24, 2019, with links to sources. The so-called "Islamic State" (ISIS/ISIL) has lost its last populated territory in Syria, but it still operates freely in some remote desert areas. Meanwhile, the situation remains tense along the Russia-Turkey-brokered "buffer zone" between rebel and government territory in the northwest. See all this and more on the latest update to PolGeoNow's concise, professional Syrian Civil War control map, which includes a timeline of changes since our previous Syria map report in January, with sources cited. Up-to-date illustration of current territorial control in Syria, color-coded for the Assad government, rebel groups, "Islamic State" (ISIS/ISIL) fighters, and the Kurdish-led Syrian Democratic Forces (SDF). Colorblind accessible. Outline showing the approximate location of the one publicly-known US "deconfliction zone"
Special symbols indicating towns dominated by rebels of the former Al Qaeda Nusra Front (now Hayat Tahrir al-Sham or HTS) and by the Kurdish YPG militia (part of the US-backed SDF). Locations of recent control changes and other important events, including Baghuz, Murashidah, Saraqeb, Arima and more. Detailed timeline of important events and changes to territorial control since January 27, 2019, compiled by our Syria-Iraq expert, with links to sources. Categories: asia, conflict zones, divided countries, isis, kurdistan, middle east, premium, rebel control, syria, the "islamic state"
Welcome to PolGeoNow's new series of Afghanistan control maps! In the coming months, we'll publish more maps and timelines spanning the gap between 2015 and 2019, leading into routine updates of the current situation. To secure your access to all future installments, sign up now for our professional conflict map subscription service! Basemap by Koen Adams of onestopmap.com, with territorial control by Evan Centanni. Contact us for permission to use this map. Afghanistan: Who Controlled What in 2015? The date is October 2, 2015. 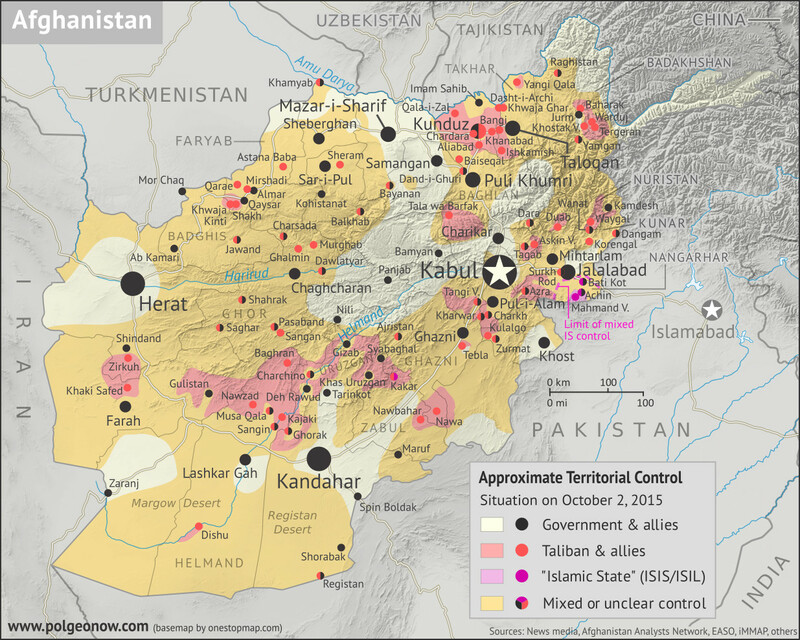 In the year and a half since the low point of Taliban control shown in our April 2014 Afghanistan map, the rebel group has been steadily expanding its territory. Most recently, the Taliban have launched a surprise takeover of Kunduz city, one of northern Afghanistan's major population centers, and the first provincial capital they've controlled since their national government was overthrown in 2001. Meanwhile, as the current government pours all its resources into taking the city back, the Taliban take advantage of the chaos to seize control of various other districts across the Afghan countryside. Meanwhile, the so-called "Islamic State" (IS; formerly ISIS/ISIL), based thousands of kilometers to the west in Iraq and Syria, has established a formidable new branch in Afghanistan. This IS affiliate - known officially as "Khorasan Province" - has carved out a small territory of its own in Nangarhar, along the border with Pakistan, and is now reaching what will be the height of its power in Afghanistan. Though both IS and the Taliban are religious hardliners, IS's brutal tactics, largely foreign membership, and claimed superiority have made it an enemy of the Taliban, and left it with very little support among the Afghan people. 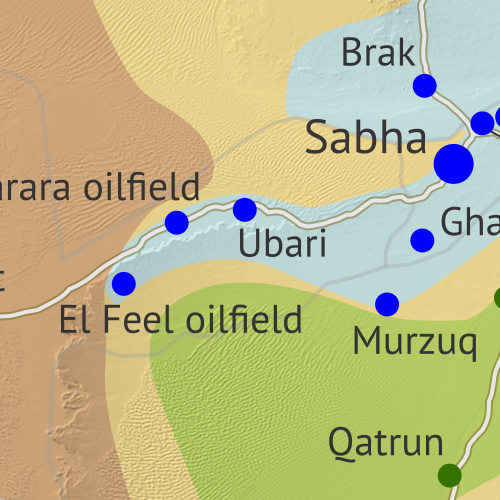 Since last month, the Libyan National Army (LNA) of General Khalifa Haftar has rapidly expanded its control of major towns and oil fields in Libya's southwest, clashing with regional Toubou militias and threatening Tuareg militia control as well. Meanwhile, the so-called "Islamic State" (ISIS/ISIL) is still active in some parts of the Libyan desert, despite its leadership facing defeat in Syria. See all this and more on the latest update to PolGeoNow's concise, professional Libyan Civil War control map, which comes with a timeline of changes since our previous Libya control map report in July 2018. 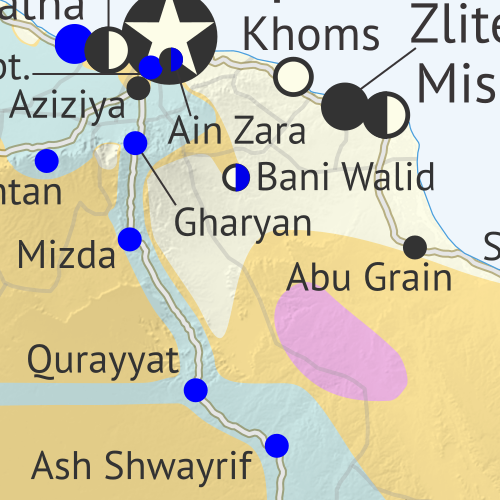 Locations of recent fighting and military operations, including Murzuq, Ghadduwah, the El Sharara and El Feel oil fields, and more. Detailed timeline of important events and changes to territorial control since July 19, 2018, with links to sources.